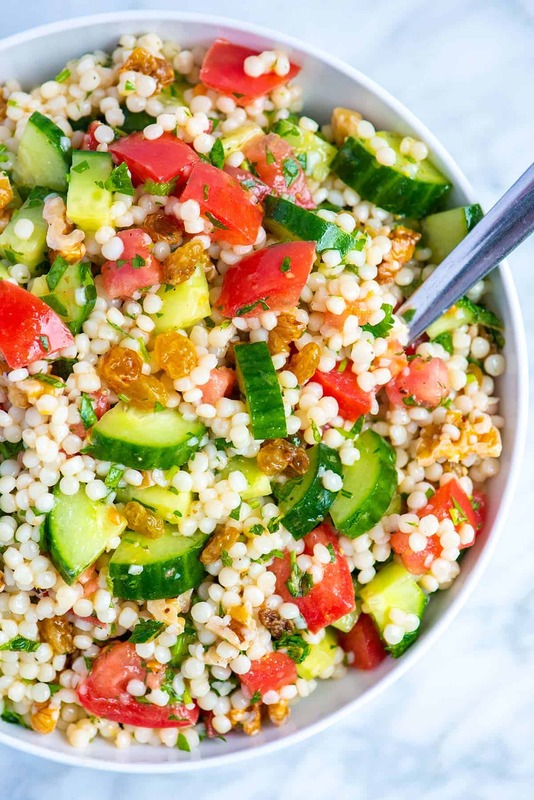 How to make light and healthy couscous salad with a simple lemon vinaigrette, cucumber and herbs. 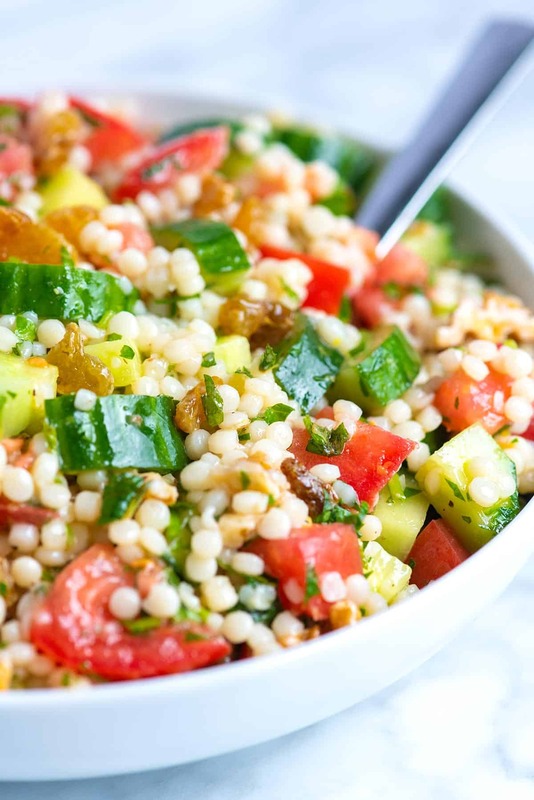 Jump to the Easy Lemon and Herb Couscous Salad Recipe or read on to see our tips for making it. It really doesn’t get much fresher than this. We love this light salad — it doubles as a side, can be the main event or works well topped with grilled chicken or Adam’s favorite, shrimp! With lots of texture from crisp cucumber, sweet tomatoes, crunchy nuts, and raisins, this is certainly one of our favorites. You can even make it ahead of time. By the way, we love this salad so much we created spin-off using orzo pasta. 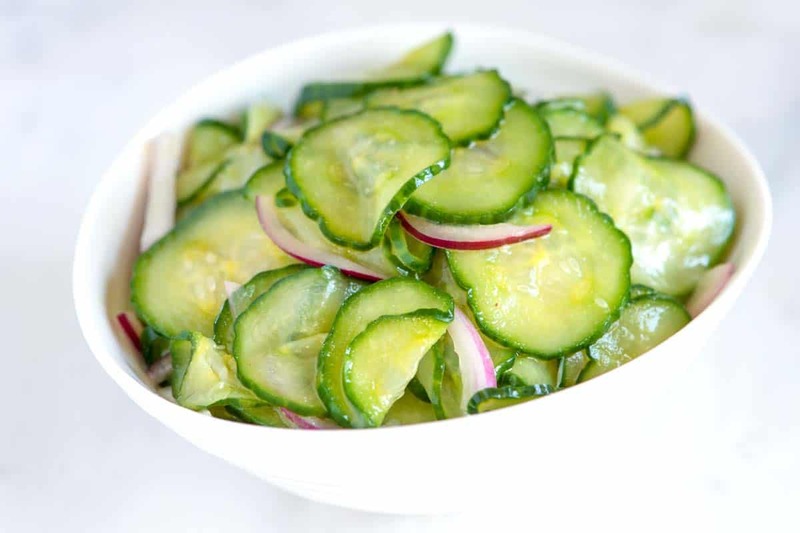 If you love this salad, take a look at our Lemon Orzo Pasta Salad with Cucumbers and Olives. Serve this salad warm or cold. You even swap or add your favorite fresh ingredients. We love crisp cucumbers, tomatoes, and golden raisins. The base of the salad is made with Israeli (or pearl) couscous. What is Israeli Couscous? Israeli Couscous is a little different from what most of us think of when we hear couscous. It’s in the shape of small round pearls made from semolina flour and wheat and is very similar to pasta in its texture. In fact, you actually cook it in boiling water for about 10 minutes then drain. 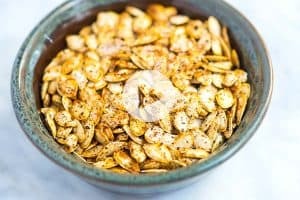 Easily use in place of rice, or even in place of pastas in soups or salads. If you cannot find Israeli Couscous, you can substitute with a small pasta shape such as orzo or use regular couscous. To make the best, most flavorful salad, add the vinaigrette to the couscous while it is still warm. We do the same with pasta salad and even potato salad. Since the couscous is warm, it soaks up all the flavor from the dressing. Speaking of the dressing, this is one of my go-to recipes. 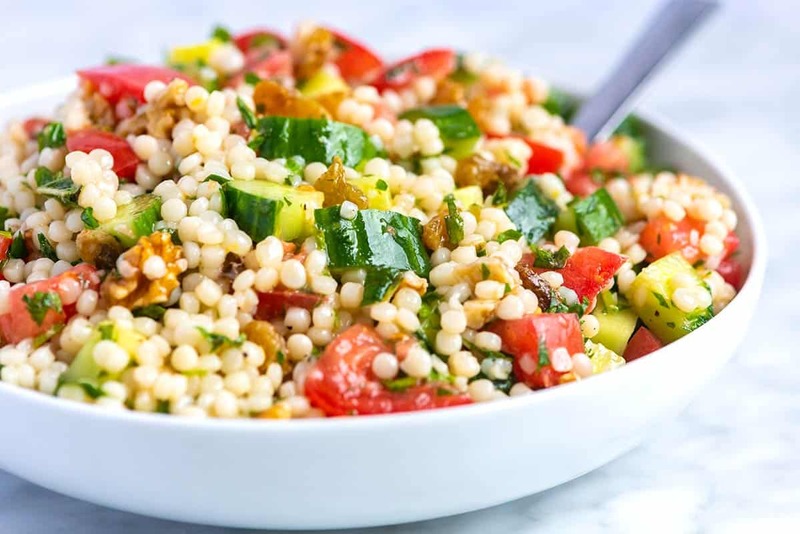 We love keeping this salad light and fresh, so our favorite dressing to toss the couscous in is a light lemony vinaigrette. It’s simple — and great to toss with warm veggies like carrots or as a light salad dressing. All you need is Dijon mustard, honey, lemon zest, lemon juice, and olive oil. Just whisk together until creamy, and then season with salt and pepper and you’re done. Once the couscous is dressed, it’s up to you for what else you add – we love diced tomato, crisp cucumber, lots of fresh herbs, golden raisins, and crunchy walnuts. 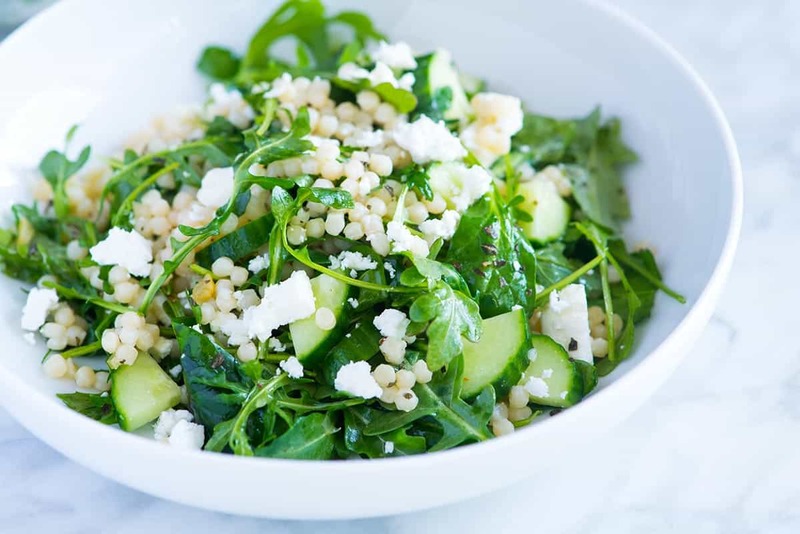 Try this Lemony Arugula Salad with Couscous, Cucumbers and Feta! The moment you make this salad, you’ll be itching to make it again. The salad is simple, fast and tastes like it came from a fancy restaurant. 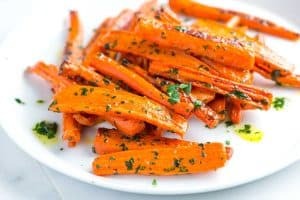 This is delicious when eaten straight away, but you can also make the salad, cover it and refrigerate for up to 4 hours. This way all the flavors marry and mingle, making for an even more delicious salad. If you are planning to make a day or two ahead of time, keep the tomatoes and walnuts separate until you’re ready to serve. This way they will remain crisp. We love this light couscous salad — it doubles as a side, can be the main event or works well topped with grilled chicken or Adam’s favorite, shrimp! With lots of texture from crisp cucumber, sweet tomatoes, crunchy nuts and raisins, this is certainly one of our favorites. You can even make it ahead of time. See the notes section below for our tips. Bring a large saucepan of salted water to a boil. Add couscous and cook until tender, 8-10 minutes. Drain. While the couscous cooks, in a large bowl, whisk the oil, mustard, honey, lemon zest, lemon juice, 1/2 teaspoon of salt, and 1/4 teaspoon pepper. Add the drained couscous to the dressing and mix well. Stir in the cucumber, tomato, herbs, walnuts and raisins. Taste for seasoning and adjust with salt and/or pepper as needed. Enjoy warm or cover then refrigerate until cool, about 1 hour. If you cannot find Israeli Couscous, you may substitute with a small pasta shape such as orzo or use regular couscous. To toast walnuts, add to a dry pan over medium heat. Cook, stirring frequently until the nuts turn golden brown and become fragrant, 5 to 10 minutes. Make-Ahead: This salad is delicious when eaten straight away, but you can also make the salad, cover it and refrigerate for up to 4 hours. This way all the flavors marry and mingle, making for an even more delicious salad. If you are planning to make a day or two ahead of time, keep the tomatoes and walnuts separate until you’re ready to serve. This way they will remain crisp. Nutrition facts: The nutrition facts provided below are estimates. We have used the USDA Supertracker recipe calculator to calculate approximate values. We assumed 1/4 teaspoon of added salt. This was so tasty! I followed exact instructions but added some chicken for some added protein to make it a full meal! So delicious! Love the size of the Couscous. Great dressing with added garden herbs of dill, mint, basil and parsley. I used 5 tablespoons of fresh lemon juice and it was fresh and lovely served warm. Will have more salad served cold tomorrow and see how the flavors of the herbs continue to blend. Delicious and a nice summer and easy after-work dish! Left out raisins and added olives and mozzarella pearls. Fresh Cherokee Purple tomatoes fresh from the garden. Hello, I’m not a mustard fan but love all the others elements of your salad. Do you think I just not add the mustard or maybe you have an idea for a substitute? Thank you. Hi Sarah, You can leave it out. The mustard adds a little more zing to the dressing, but I’ve made this without it before and still loved it. 10 out of 10!! FOR SURE. It was amazing, refreshing. We loved this. I literally ate it for breakfast the next morning. We almost tripled the nuts and golden raisins, and used pecans instead of walnuts. Do you think sweetened dried cranberries could be substituted for the raisins? I loved this salad! I had to make a few changes based on what I had at home. I didn’t have lemon but I had lime so I used the juice of one lime and also added in some balsamic vinegar. For fresh herbs I have chives and dill, which I used a ton of. I used a couple small tomatoes and one English cucumber. I also crushed two cloves of garlic with a garlic press and stirred that in. Tons of pepper and salt. I didn’t have any walnuts or raisins but I’ll definitely add that in next time. Even without those changes the salad was so good. Loved this but increased the tomato and cukes and doubled up on the lemon we like it tart. 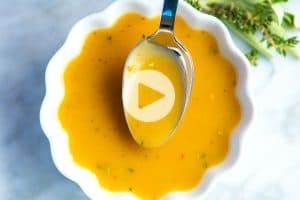 Love the recipe and video! Will try it soon. Take care, you guys. Hands-down the best couscous I have ever tasted. Refreshing, delicious, perfect with salmon. Am using this as a healthy alternative with my veggies, great taste! 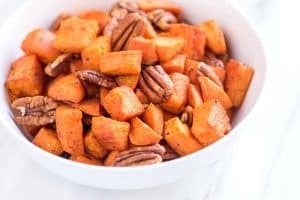 Not sure if this is too late — I just made this recipe, and it was divine! I added some chickpeas and diced red pepper, for good measure. That vinaigrette is really wonderful. Thanks so much! I ended up making this for 16 people as a side dish, and it was a huge hit yesterday. I made it the day before, since I was cooking up alot of other dishes and it was fabulous. I just squeezed a little fresh lemon over it the next day to give it some freshness. It was delicious! Nice. Great idea to liven it up the next day with extra lemon juice! If you are making this for 16 people – can you just multiply the ingredients by 4? Usually you can do that but with the couscous I’m thinking the proportion of water might not work? Yep, you just want a larger pot to cook the couscous — or do it in batches. was wondering if you could substitute quinoa for the couscous… looks very delicious! Sure! That’s a great idea. Lovely, fresh salad. Will make often. Thanks for sharing. Delish! I was snowed in and didn’t want to go to the store so I used what I had..cilantro…sautéed celery, onions, broccoli (no cucumbers here) and added minced garlic.. Didn’t use nuts or raisins because my husband is on WW… So good! Thanks for sharing! WOW! This is what i have been looking for a long time.Easy to cook and tastes great. I want this in my fridge ALL the time!! Rarely review recipes I print…just make them and never give credit where it is due…shame,shame…but this salad is so scrumptious it would be a sin not to tell the world about it. I was looking for something special (and pretty) to make as a side for my mom’s Mother’s Day dinner. We had bbq chicken, 2 different couscous salads, delicious blanched green beans- everyone kept coming back for more of the Lemon & Herb Couscous salad! Could not get enough. We served it chilled and it was absolutely just as refreshing as the picture. I always go to Publix and pick up the “Near East” pearl couscous for this recipe and then follow the Gallaghers’ method verbatim. Cannot wait for heirloom tomatoes to come in and complete this ensemble. Bought fresh cucumbers and corn from the market (peaches n’ cream) and used cilantro and dill for the herbs. Left off the raisins and walnuts. I like to serve this cold- so the pearl couscous is much better for that- in general, when I think of couscous, I think of pearl couscous- the regular kind just seems like quinoa to me. OUTSTANDING. For the past two summers, I have made a black bean, red pepper, avocado, white corn salad with a vinaigrette that is delicious but needed a change and was searching through all these fresh summer recipes that just weren’t doing it for me until I found this one! Bravo Gallaghers. We have made it every week since! It’s our staple this summer (and certainly for many to come!) Thank you!! Hi, Joanne! Just to let you know that this dish made the list of the 25 mouthwatering dishes from different blogs in From Brazil To You…Cheers! This looks so refreshing!! I have everything but the raisins. I want to make this!